Intense vibration capability that lets you feel the action! Ordered for my Wii. Works great, no complaints, timely shipping. Great buy. Thanks again Luke Games. As always shipping was fast and the price was great. Never had a problem with a order, anytime I need video games or accessories I’ll buy from Lukiegames.com. Great controller, as another reviewer said a little too sensitive sometimes but honestly we ordered once exactly like this from amazon and paid triple. This is where we will be buying more form as ours break down...not from throwing them of course(sarcasm) lol!!!! So far so good. I only use it once or twice a week to play NCAA football 2004. As everyone knows, time will tell with this item. Because controllers tend to break down with continued usage. Will follow up. arrived just as shown, brand new! 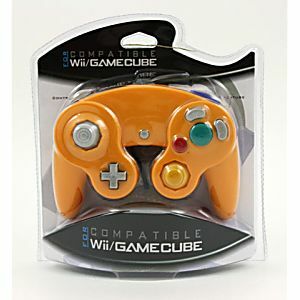 I purchased this controller for my Grandson to use with his game cube. We had it shipped to him directly for his birthday. He is extremely pleased with it and uses it all the time. So far so good. I would recommend it to anyone who has a game cube. The price is right and it is a great value. Was a bit skeptical since it was so cheap but it works perfectly for me. I got 3 of them and had them for 2 months now and my friends and I use them regularly. So far none of the buttons or joysticks have shown any signs of being defective. 10/10 would buy again. Great controller. Works well. Great price. Works as well as the controller made for Gamecube, they just don't last as long. Great controllers, work and feel very close to Brand name. Only down side is when using the Stick to select characters in some games, the movement on the screen is almost too sensitive. Other than that no complaints in gameplay. Gamecube controller works very good. My boys like it a lot..